ORB=Open Rocrail Booster - 1 ORB-1 is a model train digital booster to use with many systems including ORD-1. Last version is 1.22; Older versions are not available. With 0,5W zener diode, Z3 tends to break due to high inrush current to C1 and C2. Proposed solutions: Use 1,3W zener or insert a current limiting resistor (100R) in series with Z3. This problem exists in all previous ORB-1 versions, as well in ORD-1 < v1.4. Status: Basic tests passed. Some performance tests remains to do. Power resistors:0R22 for 3A output. 0R15 for 5A output. Use 4W types, max 17mm length. With creative mounting and soldering you may use longer types or even bundles of 2W metal film resistors, like 4pcs 1Ohm in parallel for 0.25Ohm. 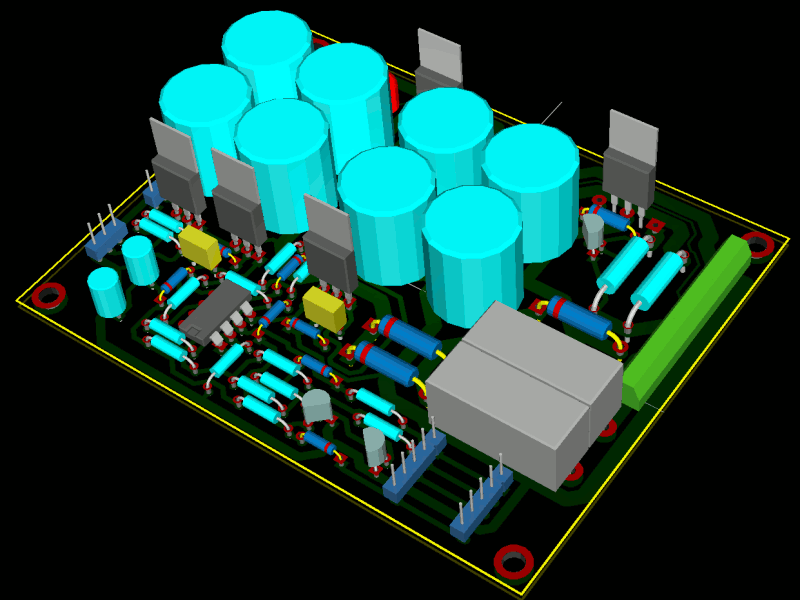 Darlington transistors: The design is for TO218 cases but you can use TO220 too. Several types will do. Smoothing capacitors: Use either C17-C14, 16mm diameter, 7,5mm leg spacing, minimum 35V or C5 and C6, snap in type, max 35mm diameter, 10mm leg spacing, minimum 35V. If you plan to use a transformer without center tap, use largest possible capacitance, minimum 2x6800uF for 3A output or 2x20000uF for 5A output. Rectifier diodes: The diodes must sustain full power usage. We recommend 1N540X series, like 1N5404. You can also use a more powerful type, like 6A10. You may use Schottky diodes if you want to minimize the voltage drop over the diodes. For example SR506. Heat sink: A spare PC CPU fan may be a simple and cheap solution. The box shaped fans AMD ships with their modern CPUs are perfect. Drill 2,5mm holes and thread with a M3 tap. Use nylon screws and insulating washers between TO218 tabs and the heat sink. Use P3 header to supply power to the CPU fan. Mount all small components. Please note the polarity/direction for diodes (the ring side in the square pad), LEDs (the long leg in the square pad) and electrolytic capacitors (the minus sign in the round pad). Mount the heat sink. Check that the tabs are properly insulated. For best performance, use a 2x18VAC transformer. At least 60VA for 3A output and at least 100VA for 5A output. Minimize the voltage loss to your train layout - use several cables, minimum 0,75mm2. Especially for the legacy Motorola Decoders it is important to connect BROWN to J3, and RED to J2. If stationary decoders do not hear the commands, the connection is probably swapped. If you use ORB-1 with ORD-1, please note the known signal polarity error for ORD-1 version 1.0-1.3. This simple connection works fine with Rocrail (but your computer is not galvanic isolated from the booster as with ORD-1). A three pole screw terminal, J1, accept incoming AC-power. Two fuses, F1 & F2, secures against fatal over currents. Four diodes, D1-D4, rectifies the voltage. Capacitors C5 & C6 or C7-C13 smooths the voltage. The smoothed voltage is expected to be +-24-30V with no load. Note about 1x18VAC supply: Only ground and one of the AC input terminals is used, and then only one fuse and two diodes. The circuit then becomes a half-wave rectifier. The smoothing capacitors stores charge between the AC-cycle pulses. With 1x18VAC transformer and half-wave rectifying, there is a half cycle gap between each power pulse and the smoothing capacitors must in this case be very much larger. Two 15V zener diodes, Z1 & Z2, and two standard 7805 and 7905 linear voltage stabilizers, U1 & U2, creates +-20V voltage supply for the electronics. Two small capacitors, C3 & C4, decouple the +-20V supply. The connectors P1 & P2 are linked. Several boosters can be daisy chained. A comparator with hysteresis is created with the OP-amp U3, input resistor R5, hysteresis resistor R3 and current limiting resistor R12. 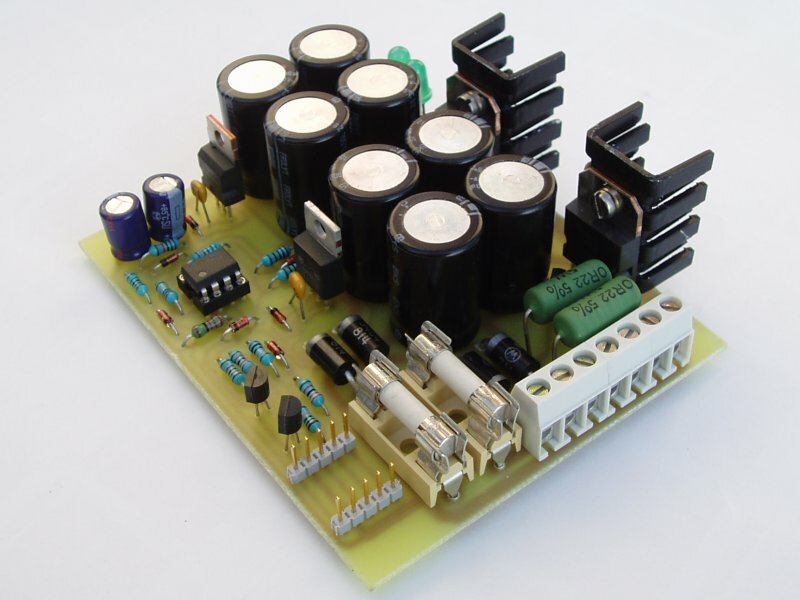 The voltage reference for the comparator is made up with a voltage divider R4 & R9. R9=15k and R4=100k creates a Vref=2,6V. R3 creates approx +-0,5V hysteresis. If the data pin in the booster bus is high and goes less than approx 2,1V the comparator output will be -20V and if the data pin then goes greater than approx 3,1V the output goes to +20V. The output from the comparator feeds the booster output stage consisting of base resistors R7 & R8, darlington transistors Q1 & Q2, current sense resistors R1 & R2 and current limiting transistors Q3 & Q4 with diodes D5 & D6. The positive half is explained: A positive voltage greater at the base resistors than approx 1,4V will drive NPN darlington Q1. The configuration is known as "emitter follower", the emitter voltage follows the input voltage to the base. The base voltage when the comparator is positive is +20V and the emitter voltage is then also +20V. This is the stabilized output feature of the design. The current through R1 creates a voltage according to Ohms law, U=R*I. When the voltage over R1 is greater than approx 0,6V transistor Q3 begins to conduct and then limits the base voltage to Q1. This is the current limiting feature of the design. D5 ensures no reverse current can flow from the base of Q3 to collector of Q3. When running normal, the voltage over the two 100uF, C1 & C2, capacitors will be about -4V (-20V+15V+1V=-4), as every negative output part of the output cycle can sink a lot of current through the zener diode Z3 and the diode D7. The positive parts of the cycle can only charge through a 10k resistor, R11, and that current is not enough to rise the voltage over the capacitors. When short circuited to ground, then the zener diode and the diode can no longer sink current to negative cycles anymore, instead voltage over the two capacitors will rise and when high enough booster bus will be high through R6 & D9. R6 limits the current if booster bus pin 5 is inadvertently forced low. D9 make it possible to have several boosters on the bus, each can drive pin 5 high but not sink current from it. The Stop/Go pin in the booster bus is weakly pulled high through the voltage divider R10 & R14. When the Stop/Go pin is pulled low transistor Q6 stops conducting and R13 pulls D8 and R15 high. Diode D8 makes the comparator output go to +20V state. High R15 makes Q5 saturate and pulls base resistors nearly to ground through D10. Then neither Q1 or Q2 conducts and the booster is off. The optional LEDs D11 & D12 shows the output voltages. Normal Stop: No lit LED. Normal Go: Both LEDs flicker (depending of the Signal frequency the LED's might be constantly on). If you don't want to use a NTC, just short P4 and choose R17 to give your wanted output voltage. See LM317 data sheet for more information.